You can download the scripts from this tutorial here . The easiest way to install Node.js is to just click on the “Install” button on the home page or grab the pre-built installer or binary from the downloads page. 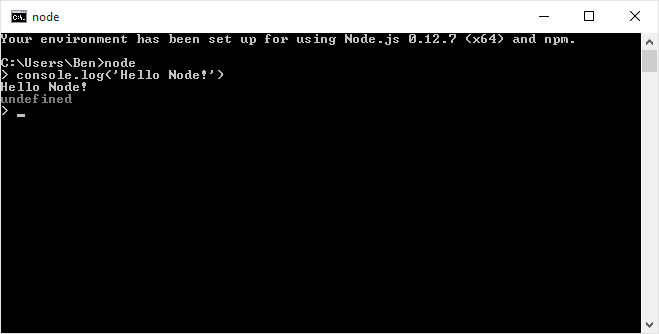 Node can load external js files, typically you will load a js file to start up your application. Create a file called “script.js”, and put the following code inside. There are many modules built in to the node executable for access to the low level things such as networking and accessing the file system. When you are working with a built in module, you can simply require it. For those developed by third parties, you need to download the file first. There are thousands of node modules out there, and so there is another program, NPM (Node Package Manager) that is designed to help find and load them. The absolute simplest HTTP server code is listed right on the home page of nodejs.org. While the total basics are great, of course you’re going to want to do something a little more complicated and practical. Fortunately, there is a very popular library known as Express that is meant to give you all the power of a complicated web server, but still make it simple to setup and get running. This will not only install the express package in the node_modules folder, but adding the --save flag will add the entry to your package.json file as well. This is important because you can easily distribute your application and simply reinstall any dependencies, this way you don’t have to store any of your dependencies in source control either. Later, when you want to install, you can simply run npm install inside the folder, it will use the dependencies listed in the file. When developing even simple web pages with HTML5 features, you often need to host them via a web server rather than simply opening the index.html file in your browser. Ajax requests and other advanced features are blocked from scripts running locally by the browser’s security sandbox. It’s easy using Express to setup a simple static file server. Those lines will setup express to serve any files within the “public” folder (note, the folder relative to the script). Any html, images, css, json, txt, etc will all be accessible via http://localhost:3000 The default page that it will look for is index.html. Now you can load things locally without running into cross domain issues (say if you wanted to open a json file locally). Express is also handy to setup a REST API for your front end development projects. It’s possible to host your back end API of course, but it’s not always the case. Often times if you are a front end developer, the service API may not be developed by you, or even using Node.js. This doesn’t have to slow down your development however, you can setup a mock server using Express relatively quickly and easily. You can of course respond to all of the HTTP verbs (GET, POST, PUT, DELETE, etc) as well as use query string parameters and post payloads. This way you can setup the client code to expect a certain API and simply swap out the host. You can also help out the service developer by letting them know what you are expecting on the front. With Express and Node.js you can create a fully featured and robust back end API and also do more traditional server side page rendering. It just depends on how far you want to take it. I hope that you have found this guide useful and enjoyable. Please leave any comments and/or questions below. Great article, thanks for this! I was looking for something like this a week ago and here it is! Great article, please keep up this to educate us in future as well and Thank you for this one specially for the express part of the article.